I was nominated by Vogue & Vibes – Anushka Hazra to complete this tag, and I couldn’t be more excited and happy to do this! Please go to her page to show some love to this beauty!!! Thank you for nominating me!!! •Do you remember your first makeup item? Hmmm…I remember getting a kid’s makeup kit for Christmas as a little girl, but as for REAL makeup I believe it was concealer from my Nana. My perfect mascara is one with a straight wand/brush that is for thickening lashes. 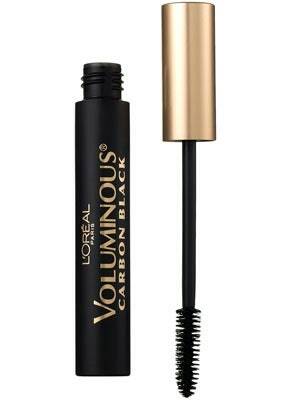 My all time favorite is the L’Oréal Paris Voluminous Mascara, I have been using it for 10+ years and I ALWAYS have one in my makeup kit. •What kind of coverage do you prefer from a foundation? I like to lay it on THICK, so I love a full coverage foundation, also because I don’t have to take as many steps such as concealer, color correcting etc. I am really into the L’oreal Infallible Total Coverage foundation right now. To be honest, I really am NOT a high end girl! But if I had to pick I guess I would say MAC. I do like to splurge on a MAC eye shadow pot here and there. •What cosmetics brands have you always wanted to try but still haven’t? •Do you wear false lashes? YES! I was getting Nova Lash done, and just started experimenting wit lashes not too long ago!!! •Is there any kind of makeup you can’t leave the house without? Believe it or not I do NOT wear makeup every day, or hardly at all. Only for special occasions. I am trying to change that about myself, but as a person, I must say that I am comfortable enough with myself to the point that I can and do go out without makeup and still feel good. •What is your most cherished beauty product? •How often do you shop for makeup? Do you like to pick up an item here and there, or get lots of goodies at once? I am always on the look out for new makeup or discount makeup. I do not seek out new foundations and concealers unless I need them as I try to use items like those up before purchasing anything new. But I do pick up things here and there as I find them. •Do you have a “beauty budget” or do you spend freely? Spend freely, baby. But then again, I do only purchase drugstore makeup for the most part. •Do you utilize coupons, reward cards, and sales when you shop for cosmetics? All the time. Mostly rewards points if I have them! •What type of product do you buy the most of? Since I’ve had lip fillers recently, I would say lip products! •Is there a brand you absolutely can’t stand? •Do you avoid certain ingredients in cosmetics, like parabens or sulfates? No, but I definable should pay better attention now as I am reaching my 30’s. •Do you have a favourite place to shop for makeup? Anywhere that has makeup, I’m going to check out the selection. •Do you like trying new skin care products or do you keep a certain routine? I prefer to keep a certain routine as I am prone to breakouts due to the fact that I have oily skin and using different products can be overly drying. •Favourite bath and body brand? AHHHHHH! Soap & Glory all the way!!! •What brand do you think has the best packaging? •Which celebrity always has great makeup? Give it up for the Kar-Jenners. •Do you belong to any online makeup communities? •Do you like multi-functional products like lip and cheek stains? •Are you clumsy in putting on makeup? Only while applying winged eyeliner! •Do you use makeup base/primer for the eyes? Not anymore, now I just use my foundation/concealer, but I DID at one time use NYX Jumbo Pencil in Milk or ELF eye shadow primer. •How many hair products do you use on a typical day? •What do you apply first, concealer or foundation? Foundation first then concealer, but I actually used to do it the opposite way! •Would you ever consider taking makeup classes? I would love to, but first, I need to finish my Bachelor’s degree. •What do you love about makeup? I love that you can be creative with makeup and that it’s not just a tool to help a person boost their confidence, but it is also an art form and should be recognized as so. You can change so much of yourself with makeup whether it be theatrical, special effects, or just a daily makeup routine…Makeup is also fun, it is a hobby and highly collectible. I love every aspect of it. Such great answers! Especially the “only while applying winged eyeliner one”. So relatable!!! Thankyou so much for doing this tag. Hope you enjoyed it! You have a beautiful blog and I absolutely love it! Thank you I am so glad you like it. I really am having fun with it and it feels nice to be accepted in this community and recognized. It’s silly but even just that nomination for the tag made me so excited! Thank you!!! I love Tati, also! She’s awesome! I love this! It was a great way to get to know you. And I also put my concealer on after foundation. Then you don’t have to use as much. Great idea! Thank you!!! I was honored to be nominated! I know its maybe a “small thing” to some people but for me, I am enjoying this all so much! This is such a great community to be apart of, like I am so glad I started doing all this…its just been an incredible experience thus far!! !